This Howard Carter Timeline has been developed to provide a 'snapshot' of the famous people and events during this historical time period featuring the Pharaoh Tutankhamun - King Tut. Important dates in a fast, comprehensive, chronological, or date order providing an actual sequence of important past events which were of considerable significance to the famous people involved with the discovery of the Tutankhamun Tomb via the Howard Carter Timeline. The discovery of the tomb of Tutankhamun and its fabulous wealth has made Tutankhamun one of the most famous Ancient Egyptian Pharaohs and why the Howard Carter Timeline is so interesting to everyone interested in the Ancient Egyptian history and the life, and death, of Tutankhamun. 1874 - 1891 Due to poor health Howard moved from London to Norfolk. 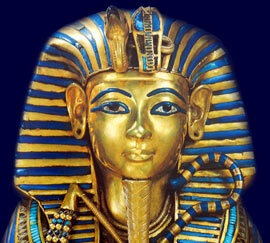 Howard Carter spent his early years in Swaffham, Norfolk, England. His father undertook some work for William Amherst. 1891 Howard Carter travelled to Egypt with Mr Percy Newberry as a junior artist with the Egypt Exploration Fund working on the excavation of Beni Hasan and and El-Bersheh. 1892 Carter was appointed Principle Artist to the Egyptian Exploration Fund for the excavations of Deir el Babri, the burial place of Queen Hatshepsut and during this time he worked with the famous Egyptologist Flinders Petrie. 1922 26 November 1922: Carter makes the famous "tiny breach in the top left hand corner" of the tomb doorway accompanied by Lord Carnarvon and his daughter Lady Evelyn Herbert. 1922 December: The press go into a frenzy about the discovery of the tomb, disturbing the work being conducted at the tomb. 1923 9 January 1923: Lord Carnarvon then strikes an exclusive deal with The Times newspaper. Carnarvon had signed a 5,000 pound contract with the London Times, plus 75 percent of all profits from the sale of Times articles to the rest of the world. Other journalists are furious about the deal, especially Arthur Weigall a correspondent from The Daily Mail. 1923 17 February 1923: The Burial Chamber is officially opened. Under the terms of Lord Carnarvon's agreement with the Egyptian Director-General of Antiquities, if the site contains an intact Pharaoh's tomb its contents have to revert back to the Egyptian Government but Carter and Lord Carnarvon are allowed to continue with excavation. 1923 February / March: Howard Carter, argues with key members of the excavation team and some are sacked. He then argues with Lord Carnarvon regarding his attitude and his 'friendship' with Lady Evelyn. Egyptian nationalists demand that the treasures of the tomb are sold to pay off Egypt’s national debt. Howard Carter and Lord Carnarvon again quarrel about their individual rights of disposal of the treasures. Lord Carnarvon wanted to keep all rights. Carter wanted the contents of the tomb to be kept intact in the Cairo Museum although insisted that Lord Carnarvon should be generously compensated by the Egyptian government. 1923 The press frenzy escalates with tales of the Curse of King Tut. The Curse of the Pharaohs idea was fuelled by a novelist named Marie Corelli. Then Sir Arthur Conan Doyle, the creator of Sherlock Holmes, announces that Lord Carnarvon's death had been the result of a "Pharaoh's curse". Each section of this website addresses all topics and provides interesting facts and information about the Golden Age of Pharaohs and of Egypt. The Sitemap provides full details of all of the information and facts provided about the fascinating subject of the Pharaoh Tutankhamun and the discovery of his tomb.